The University’s student rocket-design team is in Las Cruces, N.M., today preparing for the Intercollegiate Rocket Engineering Competition, where they will compete against more than 100 college teams from across the world. The UA team, called the Akronauts, is coming off its first appearance at the NASA Student Launch competition at Bragg Farms outside of Huntsville, Ala. This is a big deal because the Akronauts are only in their third year of existence. Yet they earned a spot in the elite NASA field on the strength of their design, their 100-page design proposal and their defense of their design in a live video interview with NASA engineers. The Akronauts are 100 members strong, and it’s not all engineering students. The team includes students studying computer science, supply chain and marketing/communication. In fact, team leader and spring engineering graduate Danny Nicolino gives credit to the marketing and communication majors who helped the team prepare the lengthy design proposal. Once in Alabama, the team exceeded its expectations. “Our rocket performed flawlessly,” Nicolino said. “We couldn’t have done any better. It traveled straight, the parachute deployed as designed, and it landed in the target area.” A payload of five clay pigeons, cradled by airbags and aerogels, landed intact. “Beyond the completion, we learned so much about what NASA expects from the student teams, and this will help us so much next year,” Nicolino said. 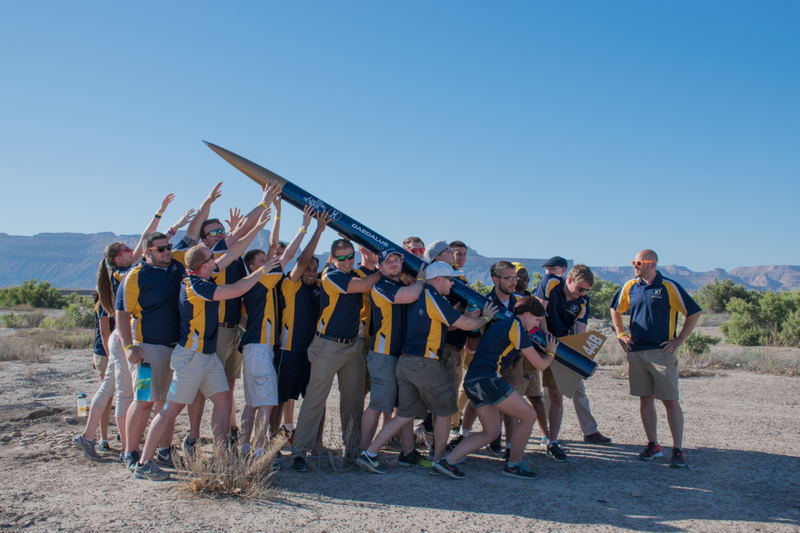 The team designs several rockets each year, each from scratch. (They even sew the parachutes!) The Alabama rocket was designed to top out at 5,280 feet. One of the rockets in New Mexico will travel to 30,000 feet, exceeding the speed of sound in the process. It is powered by a student-built motor powered by student-made fuel. At apogee, it will eject an autonomous quadcopter drone. The drone will use its GPS and camera to track the rocket as its drifts to earth. A second rocket will soar to 10,000 feet with a mock Mars habitat payload. Nicolino compared leading the Akronauts to running a small business. They design and test each rocket component. Supplies must be acquired, often in exchange for sponsorship, which requires negotiation. The design proposal much be conceived and prepared. There’s even a team that goes into local elementary and middle schools to talk about rocket design and careers in science and engineering. “We benefit from having students from many nonengineering fields on our team,” Nicolino said. Engineering major Victoria Jackson will lead the team next year. She said the Akronauts has been so valuable to her experience at Akron, but perhaps not in ways you would expect. Anna Tombazzi, vice president of the Akronauts Rocket Design Team, gives a tour of UA's presence at Spaceport America in Las Cruces, N.M. on Tuesday, June 20, 2017, as part of the Intercollegiate Rocket Engineering Competition.